In some scenarios, it is required to log in to Microsoft Dynamics CRM using different users simultaneously, usually to test Security Roles and privileges related issues. In these scenarios, we need one session logged in as a System Administrator, who can edit Security Roles and another session logged in as a common user to test Security Role changes effect. Modern browsers in general and IE specifically maintain the user identity between windows/tabs and makes the task of logging in as different user a little pesky. In IE browsers, this problem can be solved using the InPrivate Browsing. This feature allows opening a new IE window which is unaware to other IE windows/tabs cached identity and therefor allows logging in as a different user. 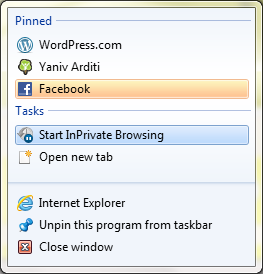 In order to open an InPrivate Browsing window, right click the IE item in the Taskbar and select Start InPrivate Browsing.